Use a computer to help tune your bagpipes? YES! 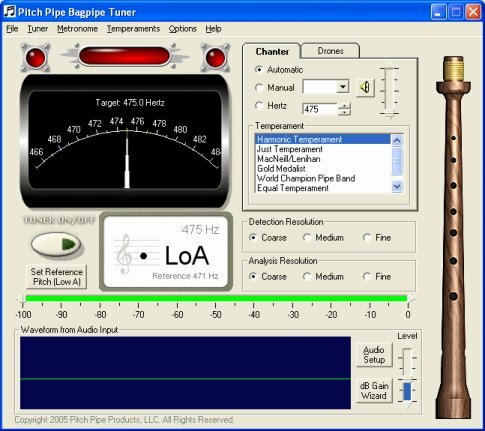 The Pitch Pipe Bagpipe Tuner is tuner software for Windows Vista/XP/2000/ME/98SE that is optimized for the Great Highland Bagpipe. A typical hand-held tuner like those used to tune a guitar or orchestral instruments are not suitable to tune the chanter of the pipes. They are configured for equally tempered scaled instruments, and often utilize limited pitch detection technology that is not sophisticated enough to 'read' the complex harmonics of our high hand. Tuning Range Optimized for the pipes, eliminates unwanted background noise. Temperaments The pipes are not tuned like a piano or guitar. Different temperament modes are included to accurately tune your pipes, and the software gives you the ability to create and share your own temperament files. Pitch Detection Resolution Control Tuner is configurable to 'rough in' or precisely tune your pipes. Allows even uneven blowers to make use of the tuner. Histogram Displays The software can display the detected pitch or level in a histogram chart. This is very useful for pipers who can use the real-time histogram displays as a training aide to assist in learning how to blow steady. Want to tune on the go? Try the PDA version of the tuner! Also available is a version of the software written for a handheld computer! 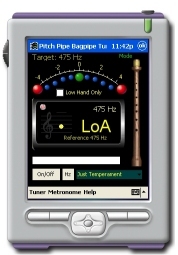 The PDA version Pitch Pipe Bagpipe Tuner is a version of the Pitch Pipe Bagpipe tuner that has been developed for PDA's running Microsoft's Pocket PC 2002 and Pocket PC 2003 operating systems. This product offers many of same great features as the PC-based system. A great addition to any sporran! The software requires Microsoft's Mobile Operating System 2002 or 2003. We recommend that users interested in the PDA version contact us with your PDA's model number, as we're still compiling our compatibility listing. Some Background: Why would a piper want to use a computer to tune his/her pipes? The scales played on the modern Great Highland Bagpipe differ from the scales used by most Western instruments. Bagpipe notes are named low G, low A, B, C, D, E, F, high G, and high A. These notes and scales do not match modern Western instruments due to slight differences in pitch and temperament. The pitch bagpipes are tuned to has been steadily rising over the years. The actual frequency of A above middle-C is 440 Hz (cycles per second). The frequency that pipers now tune low A to has risen to between 470 and 480 Hz (over a half step above A-440). This has to be taken into account when attempting to tune the bagpipes to play with other instruments. The bagpipe can produce scales that closely approximate the Mixolydian, Ionian, and Aolian modes. Most Western instruments today use �equal temperament� where each semitone or half-step of the scale is equidistant and exactly 100 cents apart. Bagpipes evolved to play unique scales with unequal ratios between each pitch. These ratios are slightly different from those used in Western modes. All of this makes it very difficult for bagpipes to play in tune with instruments that use equal temperament. Today, bagpipes are usually tuned very close to �just temperament�. Other common temperaments include the �Seumas MacNeill temperament� and �Harmonic temperament�, each with slightly different interval ratios between certain pitches. In the past, tuning the bagpipes to a desired temperament required lots of guesswork or the use of complex tuning tables that required transposition of each pitch, then tuning each note an exact number of cents sharp or flat of each equally tempered note on the tuner. The Pitch Pipe Tuner�s simple interface allows anyone to easily and exactly tune the bagpipes to any desired temperament without any guesswork or complicated tables. Users can select one of several pre-set temperaments or create their own temperament settings. This makes it easy to set up the pipes to play with other instruments no matter what temperament the other instruments use. The Pitch Pipe Tuner also includes a waveform audio input display which enables players to see the waveform of the note they are playing. This allows players to easily practice maintaining consistent airflow and steady pitch. A built in metronome also allows practice to develop steady rhythm. Without an easy and consistent way to tune the pipes, even experienced, professional pipers� ears can become accustomed to hearing and playing notes whose frequencies are slightly off from the desired temperament. The pitch pipe tuner offers pipers of all experience levels a simple and effective way to tune their pipes to any desired temperament without any guesswork. Using the pitch pipe tuner program can help beginners and professionals easily and consistently tune their pipes to the desired temperament every time and train their ear to hear the unique harmonic ratios of the bagpipe.